Funky Frolic: FUNKY FROLIC'S 500TH POST! I'm not sure if I'll post any music today, give it a few hours and I'll see what I can come up with. I replaced a few links yesterday including "Bruton BRK 02 High Adventure". ...from Italy. Often no comments = bad english. Keep on and thanks for the work! I am a HUGE fan of your blog and have not yet left a comment, so I will now and will try to be more diligent in the future. I absolutely LOVE the music you have so generously provided here. I did not know about library music until I came here (how I got here I do not remember) and I love it. Thank you so much for your hard work and CONGRATS! on your 500th post!! I'm guilty of not thanking you nearly often enough. Thank you for all the great music and here's hoping for at least another 500 posts! Congratulations!!!! Yes, you have achieved your goal & then some. Thank you. Thank you Mr. Craig. We appreciate you! I'd like to give a big thanks too! I appreciate the time you take to make this great blog! All of this in a mere 15 months! You continue to RULE, Mr.C! 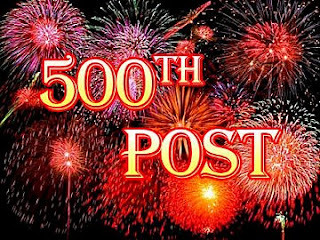 big congrats on your 500th post! big thanks for inviting us along on your wonderful Funky Frolic! Thanks for all the kind words folks! Much appreciated. Your Blog has inspired me to keep making funky beats and remixes! I appreciate all your hard work thanks!